Forever Manchester strengthens communities and enriches local life by inspiring local people to do extraordinary things together. Our approach to working in communities adopts a different way of thinking about how to work for change – starting from a place of possibilities, strengths and capabilities as opposed to problems and deficiencies, this is the guiding principle of Asset Based Community Development or ABCD. We believe that the best people to make a change to where they live are the people who live and work there and the groups they are a part of. As such, we have had Community Builders in different neighbourhoods working with residents and trying out different techniques to discover hidden talents and new ideas for community activity. “Am I happy? Yes I am. Am I happy with my achievements? Yes I am. Have my achievements made me happy? Yes they have. Pretty simple really isn’t it? “For the past 12 years my community role in housing has developed and evolved but the main aim has been to connect with the community to improve housing services. I must be doing something right as I am still here and remain happy in my work. “I have put many community and family events on in this time. Some have been a great success others not so much. Some have been well attended, some have just been me with a table full of food, bunting, leaflets and enough tumble weed to satisfy the requirements for any desert themed film for the next decade. The successful ones have always left me feeling happy but I’ve never truly stopped to reflect on the happiness of the people attending, it’s been more a case of “right, I’m happy with that, on to the next event” whilst clearing up. “Sercha is a resident I have known for a couple of years now having worked with her before my secondment started. Sercha is a tough cookie and never one to mince her words when expressing her opinions. Sercha is also clever, funny, respected by the community she lives in and after patiently agreeing to attend my first ABCD Ideas party I discovered some of her many assets include “blinging” stuff up and throwing great children’s parties. An ideal candidate to access a £250 Cash4Graft (C4G) award and throw a party with her neighbours for her community. 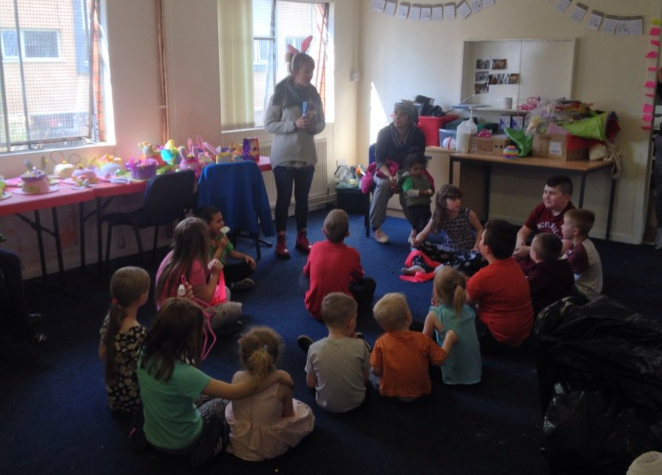 It took a little bit of encouragement but with the application made and funding approved, Sercha and her neighbours made plans to hold an Easter Party with a bonnet making competition. “Sercha and her neighbours have been to events I have organised and yes they seem to have enjoyed themselves (“it was alright”, “food was good“ were actual quotes on feedback forms from an event in her community), but had I asked about levels of true feel good happiness, I think I would have had very different results. “Sercha told me that she was racked with nerves in the run up to and at the start of her event. This was different. This was something she and her neighbours had truly invested in. At Forever Manchester we believe in giving people a ‘hand up’ and not a ‘handout’. Previously I had ran events as handouts, I would DO the events TO residents, not DO events WITH them. “The event drew to a close. Prizes were given for the best bonnets (watching Helen from FM having to choose the best was like a scene from Sophie’s Choice) but immediately the difference struck me. For one, people generally don’t stay behind and help clean up after an event. Why would they, they aren’t truly invested in it, it’s just something they come to, something to do. This time, however, at least a quarter of the people in attendance stayed behind without being asked and all helped to clear up. All still happily chatting and smiling. I took this moment to ask Sercha once more how she was feeling. Her sparkly eyes and beaming smile said it all really but the words “I feel brilliant” really took me back. I asked her why she felt so good and she replied “WE did it, I did it”. I have honestly never seen that level of happiness in Sercha before. “That’s a level of happiness I now believe can only be gained through an Asset Based approach to working.